I feel like I'm leaving a job or something... like I should be eating farewell cake and giving you all hugs. I'm super sad this is my last Creative Closet for several weeks, but I'm so excited to spend some quiet time at home and focus on my new family. -- No you haven't missed anything, we are still waiting on our little one who is obviously too cozy inside, but he will be here by next week regardless because they will induce me if I don't go into labor on my own by Friday. -- I'm also super thrilled I was able to make it to this prompt. If you have spent any amount of time around this blog you know that have a serious love for blazers. They take up a majority of my closet space. One day I will own one in every color. Excessive? Maybe. See previous looks with blazers here, here, and here. Jana is rocking her 2nd trimester. 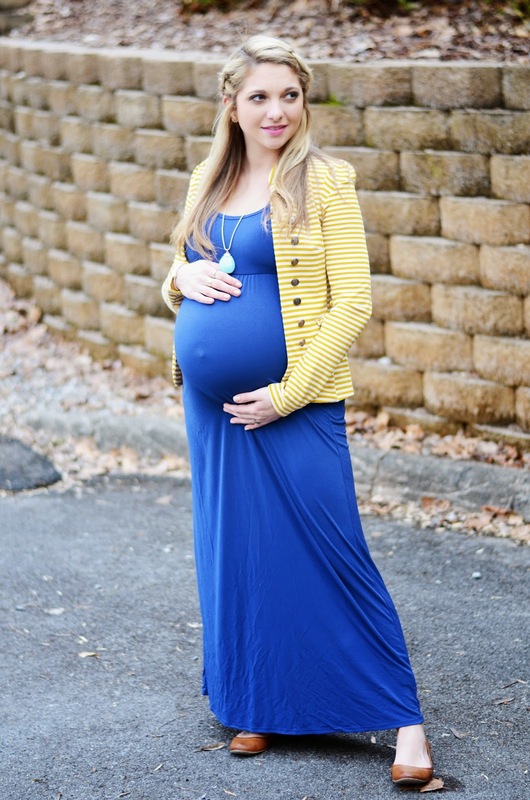 I just love it when pregnant women showcase your closet is not limited to sweats and baggy T's when your pregnant. Our awesome co-host Nancy is just beautiful and should seriously wear red on a regular basis. Click their names to see their full looks. Join the gals next Tuesday with your green so you don't get pinched! 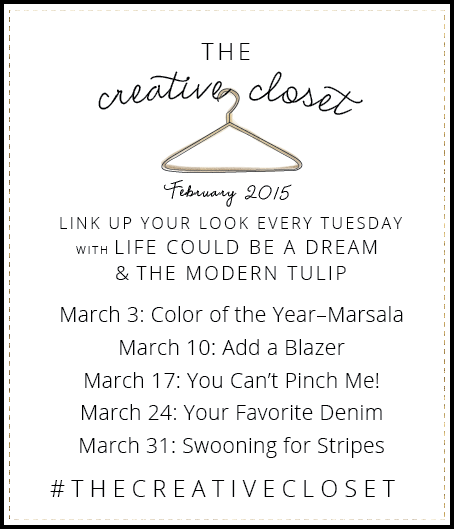 30 comments on "The Creative Closet || Add A Blazer"
The CC will miss you but it will be worth it! I can't wait to find out deets of your little man! And this striped blazer - swoon! If you would have asked me if I liked blue and yellow before this I wouldn't have been sure but I love this combo on you! 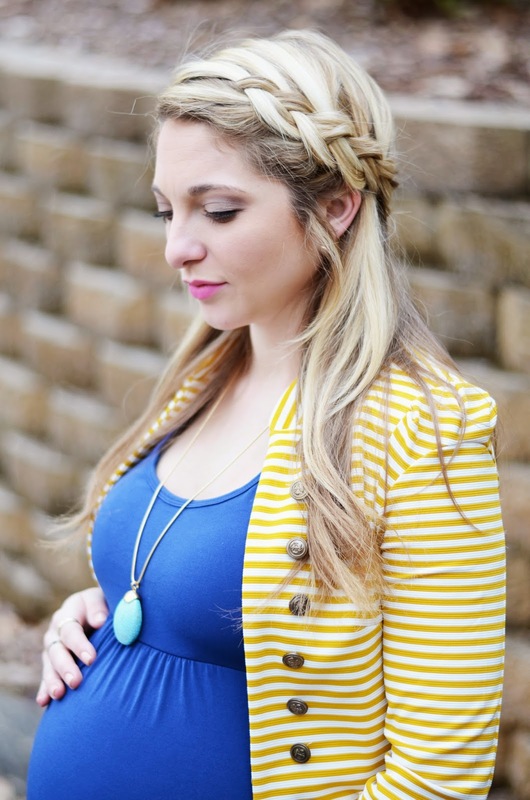 And I will miss your little preggo belly button :) Also, you are giving me major hair envy lately - I love this crown braid!! You look beautiful as usual. We will miss you at Creative Closet. 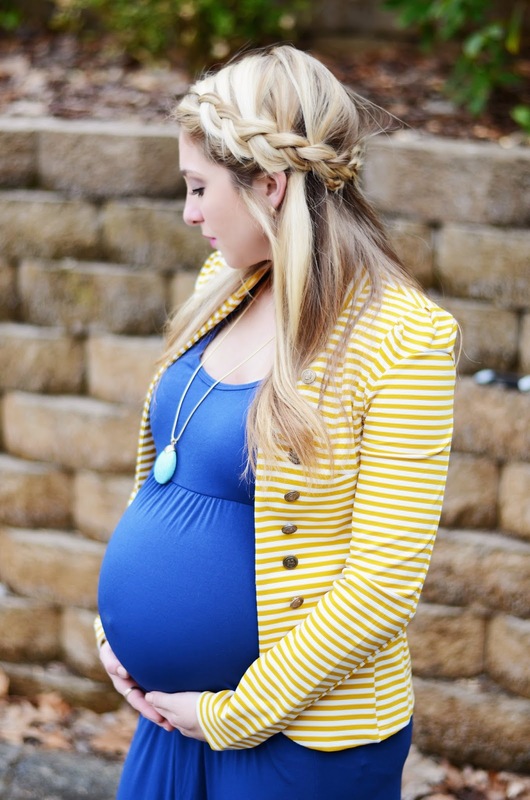 That yellow-striped blazer is great and another super adorable braid! 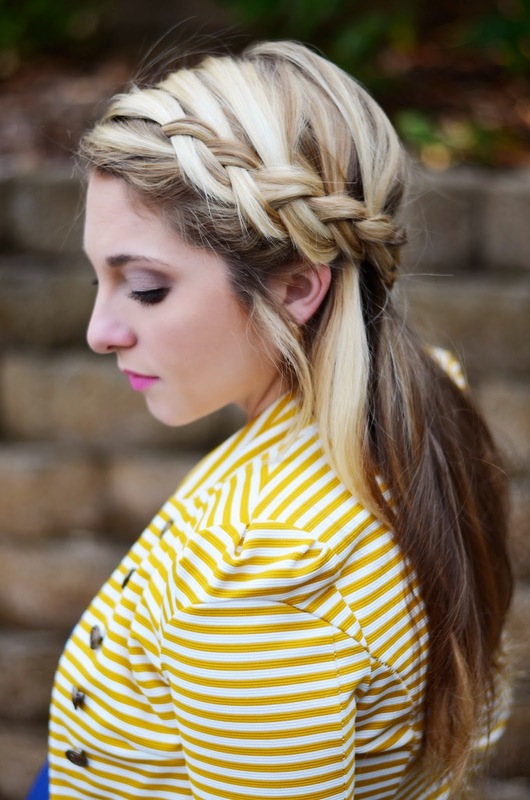 love your braid and this outfit is the cutest! YAY....your little man will be here before you know it! so happy for you!!! You picked a fantastic outfit/prompt for your last Creative Closet for a little bit. :) This outfit suits you perfectly - I love the color combination! I'm so glad you were able to do this prompt--that is such a cute blazer!! I'm a fan of blazers too and I can't wait to break out my striped version for spring. Enjoy your time off with your little one when he gets here. I'm so excited for you!! Love that yellow blazer! You are the blazer queen. Congratulations on the new little one on the way, see you in a few months! Love that outfit! 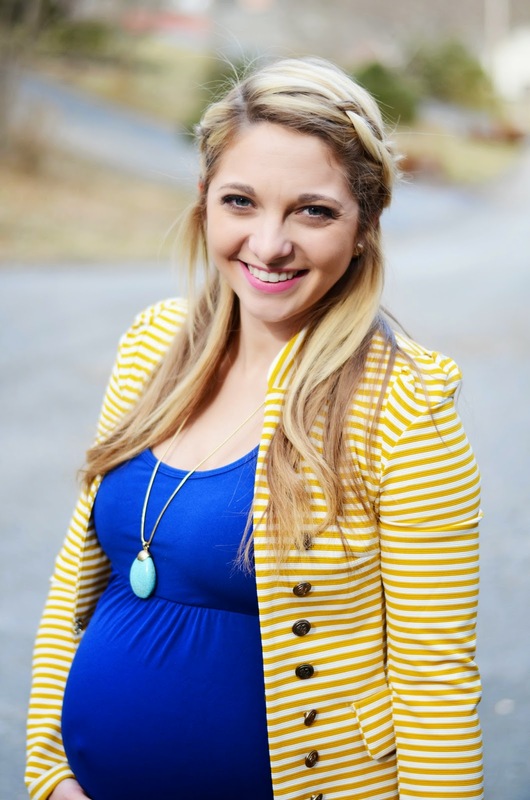 The yellow striped blazer is so adorable! I never go for patterned blazers but now that I see how you've styled it, I could be convinced haha. Love the hair. Love the dress. Lookin' good, mama! Adding a blazer to ANYTHING just makes any outfit a "wow" to me! You look stunning! your braid is beautiful!! have you done a tutorial on how to do this?! i love it ♥ beautiful. all of it. so excited for you!! Barefoot and pregnant! I love it! I'm obsessed with the detail in this blazer! I don't usually gravitate towards yellows because I thought they would clash with my hair, but this one looks incredible on you! The hair is just the cherry on top of an amazing outfit! SO pretty!! I feel like Jana and I should have sent you a cake or something :( I sure will miss you around the blogsphere but I am excited that your little one is going to make his debut :) Hope you get some rest!! xoxo! I seriously can't get enough of you and your cute belly button! Geez you are one gorgeous mama!! Love this color combo! I always love your blazers but this one is probably my favorite! Such a fun color combo! Gorgeous, girl! Oh my, that blazer is amazing! The buttons, the fabric, the collar, the shoulders...There is really nothing ordinary about this piece. I love it! What a FABULOUS blazer! Love the shape and the color and the stripes. So great with cobalt and with the maxi silhouette. I loved how both of those things fit all the way through pregnancy no matter how bit the bump got :) Excited for you to meet your little one soon. Love the blazer. I agree you can never get enough of blazer. they are a must-have in a woman closet.